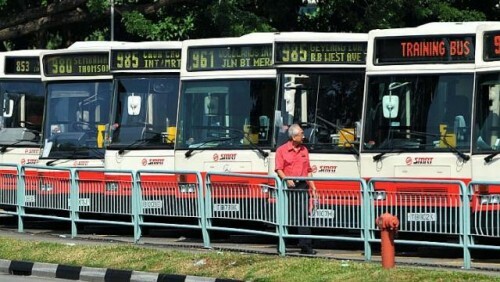 Transport operator SMRT has cast its bus driver recruitment net wider to include part-timers. It hopes to tap residents who cannot or do not want to work full-time, including housewives, to shore up its driver pool during the morning and evening peak periods. Asked how many of such flexi-hour drivers it hopes to hire, SMRT chief executive Desmond Kuek said: "We want to get as many as we can, because we're facing a shortage." Successful applicants will be paid between $10 and $12 an hour, a rate which SMRT said is slightly higher than the average earnings of a relief taxi- driver. In addition, they will be entitled to benefits commensurate with the hours they clock. Mr Kuek was speaking at a ceremony yesterday to launch an integrated career development centre for bus drivers at the Devan Nair Institute for Employment and Employability in Jurong East. The first of its kind here, the centre will be open to all bus industry professionals - public and private - when it is ready in about a year's time. It will have bus simulators to help drivers sharpen their skills, deal with difficult situations that might be too dangerous to replicate in real life, as well as shorten the time it takes to qualify. Mr Kuek said the centre will "widen and deepen" a driver's skills sets, and "uplift the professionalism of the whole bus industry". The career centre aims to make bus-driving more rewarding, paving the way for a more structured and clearer job advancement path "that goes beyond driving buses". "With the right training and aptitude, our staff can progress to other areas such as driving instructorship, and management and supervisory roles in our depots and interchanges," said Mr Kuek. Mr Gilbert Tan, chief executive of the employment institute, said that besides technical skills, trainee bus drivers will learn safety and service aspects of the job. This, he said, will enhance the experience for commuters. Observers said the initiative, supported by the National Transport Workers' Union, could reduce the industry's reliance on foreign drivers as it ramps up staff strength to cope with a fast-expanding fleet. Singapore's bus fleet will grow by 35 per cent to about 5,400 by 2017.